By Denis Walsh, who has practiced construction cost consulting for more than 40 years. The NDP-Union plan to ‘prioritize local hirings’, ‘other hiring mandates’ and ‘have more opportunity for apprenticeship training’ will add significantly to project costs: productivity down/costs up. They have imposed a new engineering discipline on infrastructure projects: ‘social engineering’. The ‘Community benefit agreement’ for the Pattullo Bridge and other projects will come with a big price tag. The amount will depend on the implementation by the bureaucratic administrators. Contractors are currently suffering from ‘regulation burn-out’ as a result of the overwhelming burden of regulations from all levels of government. It has increased relentlessly over the past twenty years with a corresponding increase in construction cost. This new set of regulations is Trumpian in its audacity. The cost increase will match the audaciousness of the regulations. The Island Highway model of the ’90s has long ago reached its ‘best before’ date. It is incompatible with the modern construction industry. Contractors are now comprised of teams of highly qualified professionals. The increase of specialization has resulted in an ever larger number of subcontractors and suppliers. It is now an industry dominated by small business. They are not receptive to government interference that increases their costs and paperwork especially after last year’s battle with the Federal Government against its tax changes. General Contractors operate both as professional consultants and construction managers. Few have large workforces hired directly. Subcontracting is standard practice. General Contractors are increasingly brought on board at the design stage as part of the project team. Their fees are often negotiated and they manage bids from subcontractors and suppliers on behalf of the owner. Your approach to bids is not applicable to many specialized projects that demand input from Contractors from the conceptual stage of a project. This contractor expertise is in high demand and very mobile both nationally and to the US. It could result in reverse discrimination: non-union contractors and their highly qualified staff may boycott your projects. The flight of this expertise from BC could be an unintended consequence. Contractors and subcontractors maintain their own teams and work crews on a permanent basis. Hiring is done online, through personnel agencies or, for the larger firms, their own human resources department. The modern tradesperson is educated, with specialist training and is computer literate. The use of mobile devices on construction sites is now widespread. Also, specialist crews service more than one site. Transition between union and non-union sites would complicate this process. The Horgan government intends to insert itself between the contractor and his workforce. The government will set wage rates and severely restrict the make-up of the workforce. This is gross interference in the construction process and will seriously damage it. Horgan will have partly removed cost competition from the labour component of projects. The cost consequences of this non-competitive element will only be known after the fact. Only a government with an endless supply of taxpayer dollars would even contemplate it. It could also put the quality and safety of the end product at risk while transferring the legal liability to the government. 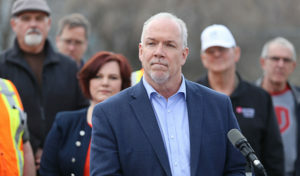 Taking the above into account, I would caution that John Horgan’s labour model is out of sync with the realities of the modern construction industry. It may not be workable. The industry has changed a lot in the past 25 years. The term ‘hiring hall’ is now an anachronism. Timing is a crucial factor in the construction market. Construction prices have spiked in the past year. The industry is busy. This reality will complicate the implementation of this new policy. My current public sector clients are having difficulty finding quality contractors and subcontractors to build their projects at a reasonable cost. This policy, in the current construction market climate, will make their job harder and blow their budgets out of the water. For major infrastructure projects such as the Pattullo Bridge, innovative project delivery methods such as public/private partnerships can produce huge cost and schedule savings. The potential savings would enable you to do more with your capital funds. The trend in the industry has been to transfer cost risk from the government to the Private Sector with a resultant cost saving. This policy would reverse that trend and return risk and cost back to the government and the taxpayer. Even for smaller projects such as schools, exploring different project delivery methods is now common because a ‘one-size fits all’ approach is considered ‘old thinking’. School districts have to maximize what they buy for their construction dollar. This policy would box them in and force them to pay more and get less. Regarding Horgan’s ‘union-only’ plan: as a general guide, anytime a client restricts supply, the price increases. The government’s new restrictions go way beyond ‘union-only’: they almost nationalize the workforce. This will have a huge negative impact on construction cost: inflexibility = higher cost is an established fact in the industry. For the potential cost impact, I can only give you my ‘gut feeling’ based on my experience with similar policies in the 90ies. I suggest that you plan for an increase of 10% to 20% on all projects affected by this policy. The actual increase will vary on a project by project basis.. For the Pattullo Bridge, I suggest that you pencil in an increased budget – say a range of $1.5 to $2 billion for now based on the assumption that the old budget of $1.4 billion was doable under the old rules – often a rash assumption with high-profile public projects. Implementation will be important. If poorly implemented, this could result in high volatility in bid prices. Poor bid responses for the affected projects could result in project delays, re-bidding and even mothballing of much needed projects. Over a three year period, this policy, depending on the scope and implementation, could absorb one to three billion dollars of the government’s capital funds. There is a high risk that this amount could increase dramatically due to current heated market conditions, poor implementation or a negative response from non-union contractors. It is a policy with a very high cost risk. Taxpayers will have to open the funding floodgates and pour extra money into these projects or the system will seize up. Those involved in maintaining capital budgets are in for some sleepless nights: it will make every project to which it applies instantly over budget and they will not have a clue how to arrive at the right budget because it is a new and untried policy for most contractors. This is how the construction market works: new and untested = uncertainty = higher cost risk = higher bid prices. The cost of these projects will not be based on competitive market prices as the term is commonly understood in the construction industry. It will be ‘Fake Competition’. The defenestration of this mainstay of cost management could have unintended cost consequences: out-of-control costs could be in the cards. Since contractors base their estimates on historical data of their work crews’ productivity on previous projects, this unknowable new system will result in a: ‘roulette wheel’ method of estimating’.